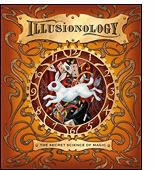 Illusionology The Secret Science of Magic is a sumptuous treasure trove of a book aimed at 8-14 year olds (I imagine) although adults will find it equally engaging. Every page is magical in itself, with special compartments revealing magic secrets, interwoven with instructions for tricks that the reader can learn, and even some special props including magic playing cards, 'pop-up' illusions and other specially produced tricks. From the publishers: "Purportedly written in 1915 by one of America's top scientists, William Schafer, the book is an expose of the tricks of the masters for new initiates of the Illusionists' Guild. As well as revealing inside info about many famous tricks - levitating a lady, making things disappear and mind-reading, among others - and providing instructions, it gives explanations of the science that makes the magic possible." Author Emily Hawkins is a highly experienced writer and editor who also wrote the New-York-Times bestseller Oceanology. Providing a raft of magical knowledge is ‘The Deceptionist’, or ‘Sav’ to his friends. A magician to the stars and member of The Magic Circle, he is immortalised in the book demonstrating optical illusions. He can make you doubt your own eyesight with amazing feats of close-up magic!